In recent years, largely due to global warming, there has been an increase in days of “extreme” heat and record-breaking summers. In fact, 17 of the 18 hottest summers have all taken place after 2001, with 2016 and 2017 being the two hottest summers on record. With the hike in temperatures there has also been an increase in the number of days with deadly heat — days during which the combined heat and humidity overwhelm human thermoregulatory capacity even for people at rest. The increase in number of deadly heat days and overall average temperature could prove to be deadly for workers who labor outside. Worker deaths due to heat have been reported all over the United States. Workers in industries ranging from construction to agriculture work full time in extreme heat with little to no protections or precautions to protect them from the dangers of heat exhaustion. According to Public Citizen, due to the record breaking summers that are now becoming the norm, the epidemic of heat stress injuries and deaths will only worsen and exacerbate other health problems such as asthma and heart disease. The effects of the temperature rise on workers can be seen in the case of migrant farmworkers in North Carolina. Researchers at the Center for Work Health found that North Carolina has historically ranked as having some of the worst rates of US heat fatalities among workers. 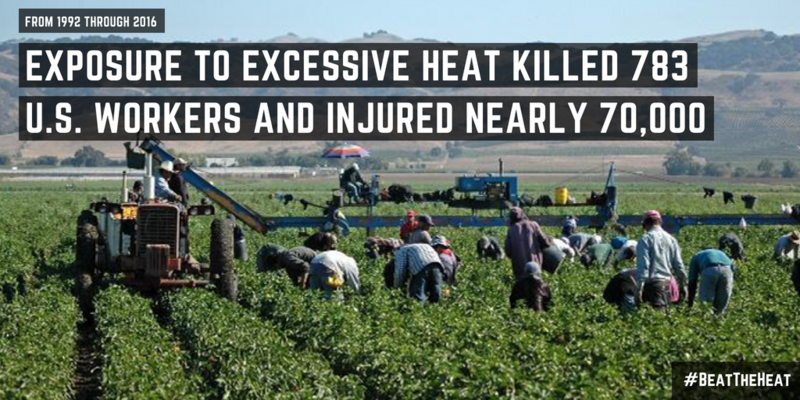 From 1992-2006, for every 100,000 North Carolina farmworkers, an average of 2.5 died of heat illness. Many North Carolina agricultural employers are required to provide cool drinking water within a quarter-mile of worksites, but because they are not actually required to provide rest breaks, workers do not always have time to drink that water. With the temperature rise that is already locked in, it is vital to protect workers from these extreme conditions. The solution to heat-stress is simple: hydration, shade, and rest breaks for workers, but many employers will not implement these solutions voluntarily. California, Washington, and Minnesota have already implemented some form of protective heat standards for their workers, as has the U.S military. But for approximately 130 million workers across the nation there is no current protection against heat stress. A coalition of organizations led by Public Citizen is petitioning the Occupational Safety and Health Administration (OSHA) to initiate the rulemaking process for the first national standard that would protect U.S workers from the dangers of heat stress. The proposed standard would include heat stress thresholds, medical monitoring, personal protective equipment (PPE) and a Heat Alert Program, among other protections and precautions. This coalition will also launch national and state public education campaigns in an effort to bring awareness of the growing problem of extreme heat.